iVoomi launching 2 phones (iVoomi 1 and iVoomi 1s) in India on 10th January via flipkart. As highlights these phones are comings with dual camera setup and full vision display at very affordable price. On papers phones are looking promising, as we don’t have any other phone at this price with full vision display and dual camera. iVoomi 1 is priced at Rs. 5999, while iVoomi 1s is priced at Rs. 6999. Both of these phones have similar specification, except storage and RAM. iVoomi 1 comes with 2 GB RAM and 16 GB internal storage, while iVoomi 1s comes with 3 GB RAM and 32 GB internal storage. These phones are powered by quad-core Mediatek 4X processors clocked at 1.3 GHz. Both of these phones are coming with dedicated SD card slot to expand storage up to 128 GB. Phones are running on Android 7.0 Nougat operating system. You can run apps smoothly on this phone, but not made to play high end games. It features 4.45 inch IPS display with 1280×640 pixels resolution and 18:9 ratio. This display have curve edges with 2.5D glass on it. Display and camera are highlights of these phone at this price point. . Both comes with dual camera setup at back with soft LED flash. Main camera sensor at back is 13 MP while another is 2 MP. The main camera comes with features like 18:9 Photography, Auto Focus, Supports Bokeh, Wide Angle, Portrait, HDR, Panorama & Face Beauty Modes. Front camera features 8 MP sensor to click your selfie, while no flash available for selfie camera. Phones are coming with 3000 mAh battery, which is supposed to give a long day back up with full charge. Talking about connectivity, these phone comes with 4G VoLTE, 3G, EDGE, GPRS, Wi-Fi, Bluetooth, USB 2.0, GPS and 3.5 mm audio jack. Both phone also features fingerprint scanner placed at back panel. 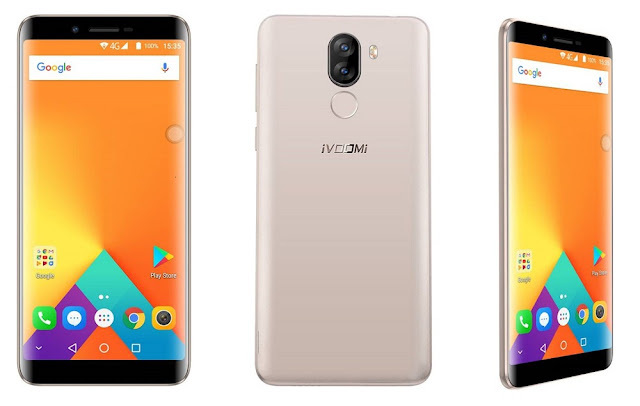 iVoomi 1 is coming in 2 colours i.e. Jade black and Platinum gold, while iVoomi 1s is coming in platinum gold color only.